Both self-parking and valet offered. 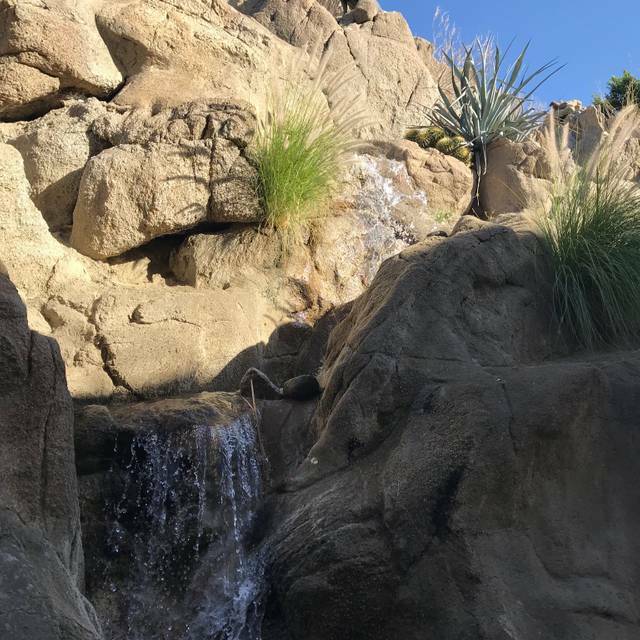 From the moment you approach the La Quinta Cliffhouse you are surrounded by the dramatic sights and sounds of this desert destination. Jutting from a massive rock outcropping above the desert floor the La Quinta Cliffhouse is renowned for its spectacular views across the valley and providing a lively, casual destination to enjoy a menu of American classics with innovative preparations focused on premium steaks and seafood at great prices. The menu highlights vibrant flavors from the valley along with a generous selection of fresh fish and seafood. The wine list has been thoughtfully chosen to complement the food and provide reasonably priced selections including rare and limited bottles. We DO NOT take reservations in the Bar area or for Happy Hour. Our family always comes here for our holiday dinners. Everything loves the restaurant and enjoys themselves! We have heard the name for years. We have a 2nd home in Palm Springs so we committed to try this establishment out next time in the desert. It was just so-so. The server was more interested in what we think was a past employee back for a dinner with friends, The food was ill prepared. My wife's steak was a bad cut, lots of gristle. Maybe we set our expectations too high? They charge a 5 star price for a 3 star performance. The server was very nice but forgot a few things we asked for. The support waitstaff were very attentive and helpful. The food could have had a nicer presentation on the plate for the price point. I can not say enough good things about the Cliffhouse. After I received my meal the waiter noticed that I didn’t look too impressed with it. I did not have to say a word. He immediately approached me and asked me if everything was OK. I told him that my meal (Classic Cioppino) was not up to their normal standards. He immediately, without any negative discussion, took the meal away and inquired as to what else I would like. I chose the scallop dish, which were excellent. Further, the manager, Dave Garvey, came over to ask me about my experience with the meal. I told him that personally I thought the sauce was too thick and the seafood was overdone. He was extremely receptive to my comments, professional, and attentive. He asked the others what they thought of their meals and my husband’s filet minion was undone for his taste. He immediately took that away and had it replaced. Throughout the evening he came by several times again to ensure our satisfaction. You could not have asked for better service from any organization. This is an excellent example of what good client service looks like. Well done to Dave and his staff and thanks for making my special occasion even more special by their attentive service. This place gets busy regardless of the day of the week, hence why service can be challenging. Food as always in excellent, the Ranch Fillet is incredible, but surprisingly so is the roast chicken. Always a good meal, which means consistent (15 years difference in visits!). A nice treat while in Palm Springs. Prime rib was as tuff as an old shoe the worst I've ever had. Took half of prime rib home, made sandwiches and had to throw it out. Will never return. 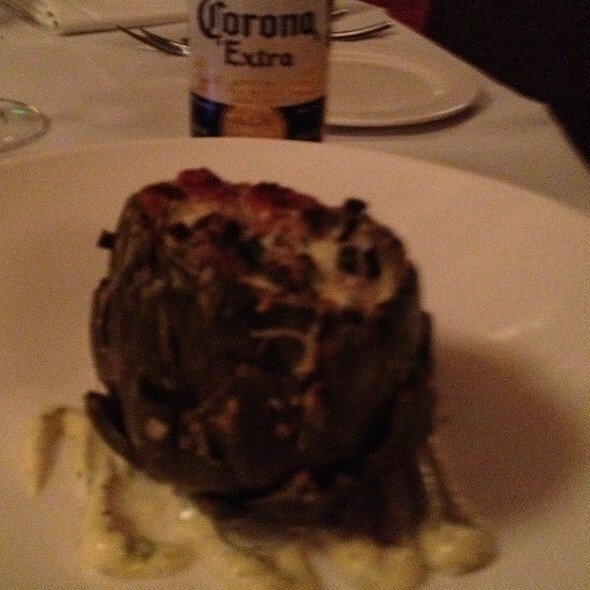 Artichoke was entersting, but my wife makes it better. Although not inexpensive, still a pretty good value compared to many other valley restaurants. Food was good, as usual, as was the service. Noise level was acceptable and view was good, although outdoor seating would have been better. We've been to this restaurant a number of times and never been disappointed. Date night for Jim and I. We have been married 45 years. And having date nights at the Cliffhouse. Staff is personable, food is delicious, and the place is absolutely beautiful. We were there for our anniversary and were very pleased with all aspects of the evening. Our server (Lori) was knowledgeable, attentive, funny and very pleasant. The food (my wife had Prime Rib and I had Filet Mignon) was delicious and prepared to perfection. 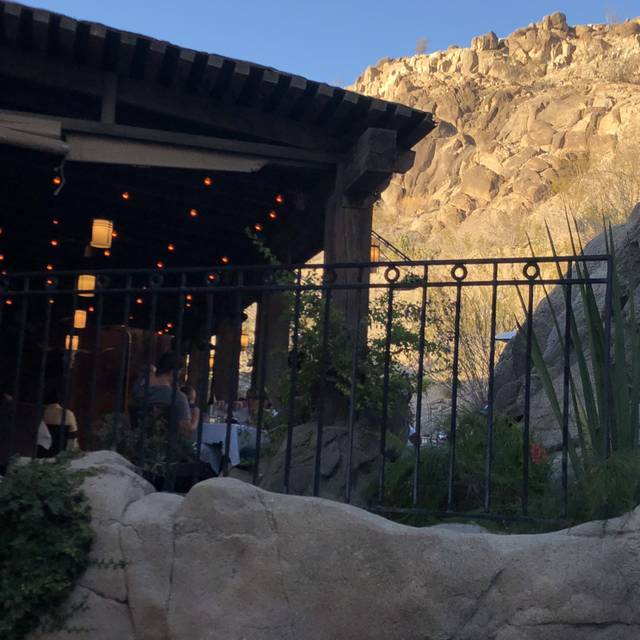 Our table was on the patio and the ambience with the waterfall and lighting on the rocks was beautiful. A great experience! Great food. And we love the ambience of the Cliffhouse. The service and the welcome were great. The food was good, but not that big. Overall, a very pleasant experience, but the prices are getting to be a bit on the high side, all things considered. A good place for a special event, but too expensive for a regular outing. Consistently, a great dining experience. Truly an outstanding value and service. The parking service, and food. Great time at the Cliffside with friends. Food was very good, delivered timely. 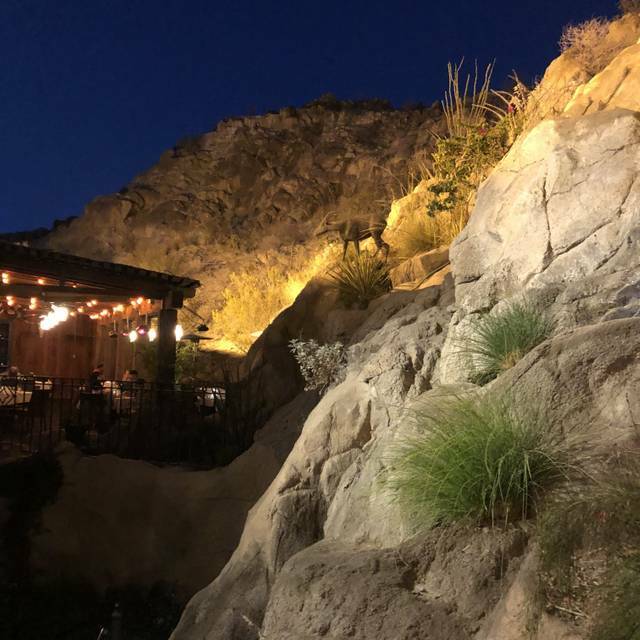 Our table for 8 was crowded into a corner next to the cliff over a sloping patio drain area so the table and our 8 guest chairs were tilting toward the slope which was uncomfortable for all. Our server, Amy, was inattentive at best... did not ever check back in after taking our orders etc. 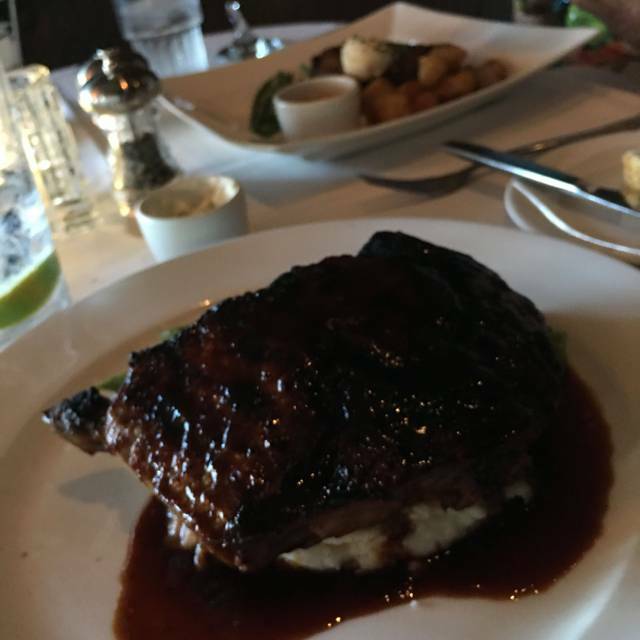 Our food was inconsistent ~ some steaks cooked perfectly to order, others overdone. The additional $14 for 2 oz. of king crab meat was hugely overpriced for the tiny amount served with the steak. None of us care for the red wine currant gastrique that the steaks arrived with - far too sweet. The caesar salad was exceptionally good! Loved the pork belly but very greasy, apple and pomegranate were great compliments but not enough to neutralize the fat. Perhaps serving the belly on a starch base such as a veg mash or crostini would mitigate. White chocolate mousse with Phylo Fettuccini was brilliant and very creative. Would have liked more raspberries to cut the sweetness or perhaps a raspberry coulis instead of caramel sauce. The food was good but I was expecting something better. I did like the steak and it was cooked just right. Loved our dining experience. Busy, but not loud. Full but not crowded. Great attention from wait staff and manager. Excellent food. Can't wait to go back and try other dishes. Food was delicious and service was great. We were there on a triple date while on vacation. Outstanding food and ambiance! Quality and tast of food was one of the best I've had. Everything was perfect from start to finish. Beautiful restaurant, great food. We had the tuna and scallops. I would recommend both. They were cooked Perfectly and delicious. Very attentive staff. Loved the sourdough bread! The facility is unique and done very well. The food, value, wine options and menu selection were very good. I think they were a bit understaffed for the crowd. Our waiter was friendly and competent, but he had too many big parties. We will definitely return and recommend to friends. We used to love going to Pacifica every time we came to the desert on vacation. The food is still good but the vibe has changed. 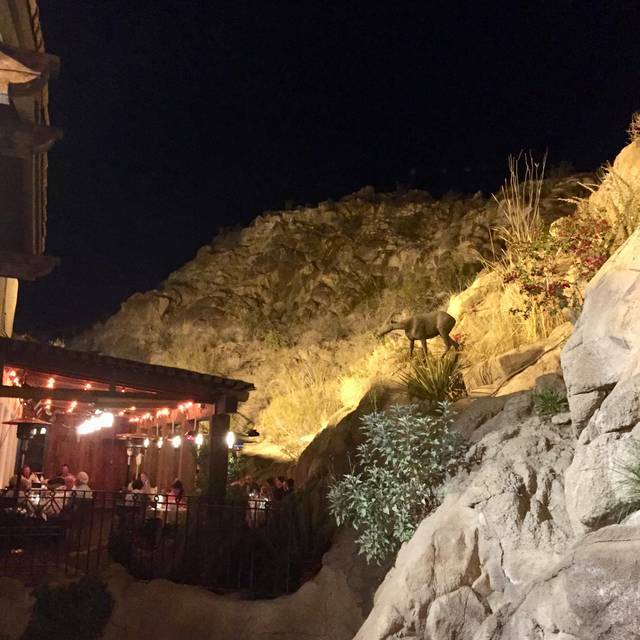 We discovered it again when we went to LaQuinta Cliffhouse for dinner tonight. The food, as always, is outstanding but the key ingredient is the clear customer focus and staff enthusiasm. The reason for that is its outstanding, engaged manager—Dave. He was what made every visit in the past to Pacifica special and made it so warm and welcoming. 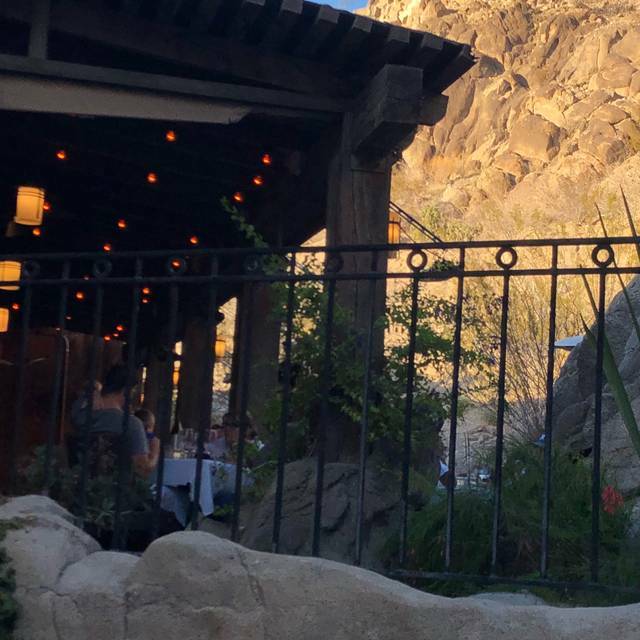 Now all those who come to Cliffhouse for dinner and all those who work there share in a special atmosphere that creates a memorable dining experience—one that makes you want to come back time and again. We will do so multiple times on our next trip back to Palm Desert and other trips for years to come. Took my wife here for our 9 year anniversary. Was taken to our table right away per our reservation. Servers took our order and checked in with anything we needed . Food was great ! The manager stopped by and noticed I had steak with little bit of potato’s and offered to bring me more to finish off my ribeye . My wife loved her plate and her drink . Last but not least was given a ice cream dessert for us to share . We loved it and will be be back to try their happy hour at the bar . Place, staff, and food great. Except medium rare on the steak came back rare rare rare. Very speedy service. Good except not much time to chat and enjoy cocktails before food arrived. Better than slow service but could have have a few more minutes between ordering and being served. Next time, we’ll know to ask for slower delivery. 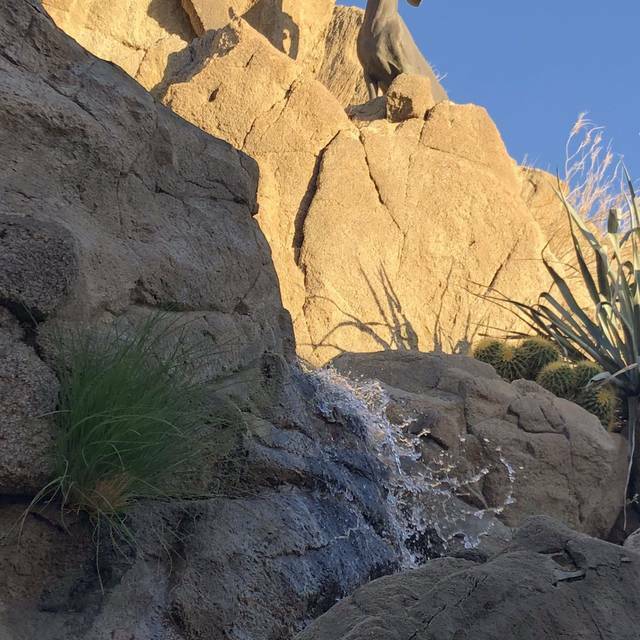 Every other year we come to the desert for a family vacation, kids, parents and grandparents. 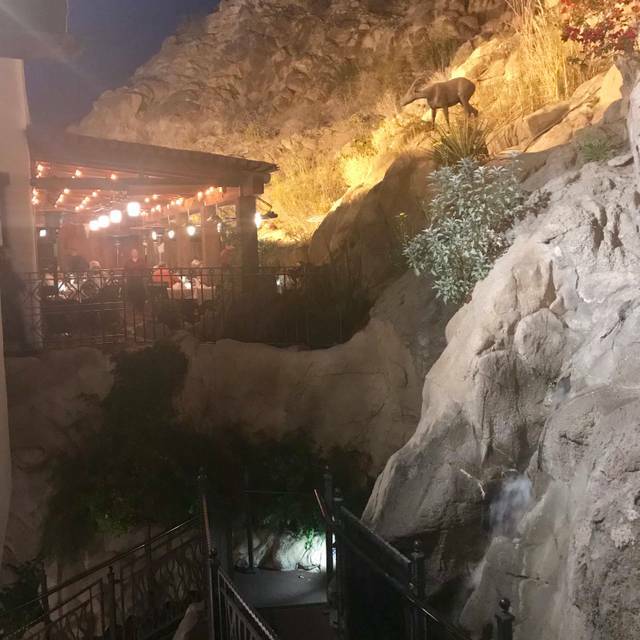 The past two times our “adult night out” has been at La Quinta Cliffhouse and our experience has been wonderful! Great food, service and ambiance. Couldn’t have been better. Absolutely love to eat there. And all bottles of wine were ½ price! The scallops are the best I have had anywhere. And the beet salad is terrific. They have a very good value early dining menu - 4:00-5:00. It did not include my favorites this time but it was clearly popular. The restaurant was packed when we got there at 5:30. As always, you can’t beat their location, value and delicious food!!!! Took out of town guest we had Great service and food definitely a good time. We take every occasion to celebrate the event with a wonderful dinner at The Cliffhouse. Excellent food, fantastic service, wonderful atmosphere, just a great evening.